Fabric provides a menu option that allows to automatically create a new component node in the Fabric hiearchy saving time. 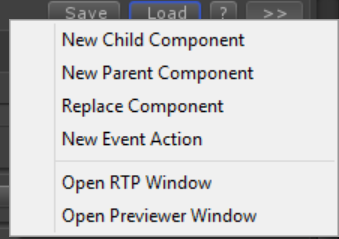 All components come with a custom inspector UI that allows modifying their properties according to their position in the hierarchy. A component displays different properties according to their position in the hierarchy or if they have a listener attached. The node info provides an overview of the component internal state and properties such as: the number of instances used/exist, volume and pitch with their randomisation offsets as well as CPU current/max usage. 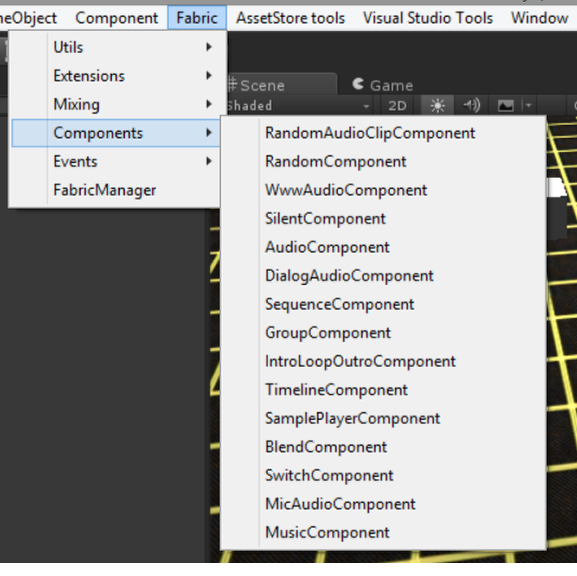 All components that are just below the FabricManager are “top nodes” so they don’t provide any override options. When a component is located as a child of another component it allows to override most of the parent properties. All of the component properties are propagated through their hierarchy and are either added or multiplied with their parent properties. However, it is possible to override some of the parent properties and use their own values instead. Any component that has an event listener attached will allow to set the number of maximum instances that can be played along with the priority and stealing behaviour that will be used if all instances are playing and a play sound event has been requested. Number of maximum instances that can be played. Note: Only used when the component has an Event Listener attached to it and therefore can be triggered. Allows to play multiple instances (if max instances>1) on the same game object. Any event action will affect all instances at the same time. Determines how important this component is. The virtualization option allows the component to store all the PlaySound event requests and track their distance from the listener. When an event is within the max distance property the component will allocate and play an instance. If the event moves outside the max distance value it will stop playing it release the instance but keep tracking it. The event will be released when an EventAction.StopSound has been received. This is a great method to start a large number of ambient sources (i.e. torches, forests, birds) each having their own unique audio position but only use a small number of audio resources. 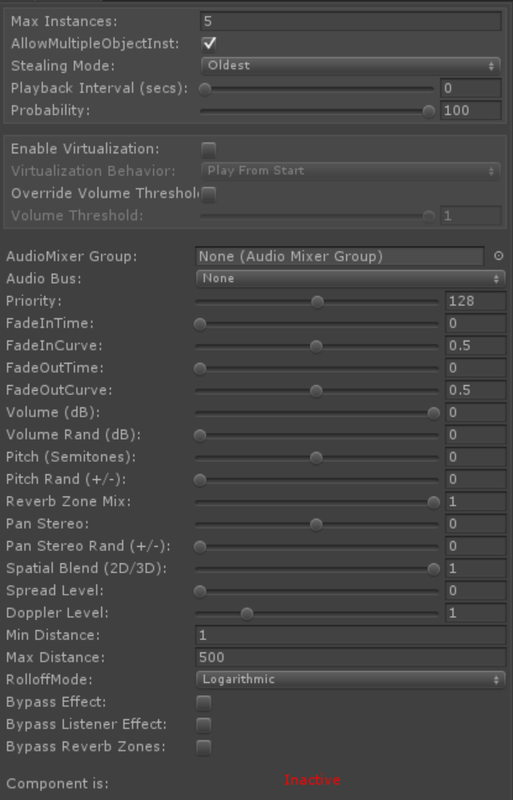 The component allows you to set the audio mixer group that all the audio sources in the hierarchy will be routed through. The fade properties are only used when the component is played either through the event system or as part of a child component (i.e. sequence, switch etc). 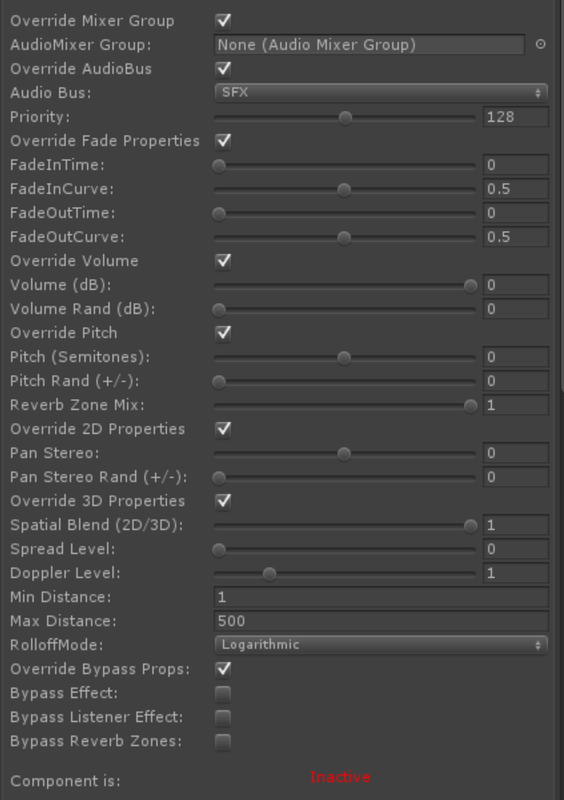 The component volume and pitch properties by default are always multiplied with its parent volume and pitch properties unless the override tick box is selected which then uses the node’s properties. Volume of the component multiplied with its parent volume. Amount of volume randomization to be added. Pitch value of the component multiplied with its parent pitch. Amount of pitch randomization to be added. The default behaviour of these properties is to passed down from their parent unmodified. When the override tick box is selected for either property then they become the properties that are going to be propagated down the hierarchy. Sets a channel pan position linearly. Only works on 2D clips. Sets how much the 3D engine has an effect on the component. Sets the spread angle a 3D stereo or multichannel sound. Sets the Doppler level of the component. Fabric provides a method to quickly import a selection of audio clips as audio components or dialog audio components. This is particularly useful when it is necessary to import a large number of audio such as dialog files into a random component etc. In order to import multiple audio clips first the inspector UI needs to be locked by pressing the small lock icon located on the top right hand corner (red circle). This allows the selection of multiple audio clips without the inspector view loosing focus. The audio clips are selected in the project tab view can be simply dragged and dropped in the drop box area and for each clip an audio component will be created according to the type selected.